Ten years ago, a heavy hitter in the voiceover industry came and spoke to my class about the world of VO. As a young pup who was VERY interested in the idea of “making money with your voice,” I listened intently and took good notes. What happened in the next 90 minutes basically amounted to telling a young kid that Santa isn’t real. The VO insider gave us the harsh, blunt truths about just how competitive & expensive this industry can be, and then proceeded to listen to & critique demos that aspiring voice talent sent him. His critique of demos was the most jarring part. The insider completely eviscerated the aspiring talent, commenting on everything from the packaging of their demo CDs to the look of their headshots to the quality of acting. After 12 seconds or so of listening, he would stop the demo, tear the actor a new one, and throw their CD in the trash before moving on to the next victim. To say that it was a sobering experience for the soon-to-be college graduate with his head in the clouds is an understatement. I was completely scared away from voiceover. Now ten years later and all-in, I can honestly say that that experience may have been the most valuable one I’ve had in my career. Without it, I would’ve graduated college- head still in the clouds- and entered the world of voiceover when I clearly wasn’t ready. I would have purchased the cheapest microphone I could find, expecting it to be my road to riches. I would have self-produced my demo in order to save money, and it would’ve sounded like hot garbage. I would have entered the voiceover world without a plan of action, and I would have been laughed out of the industry before I even had a chance to get going. Now, I’m not suggesting that everyone identify a dream of theirs, get scared away when they’re exposed to the harsh realities about that dream, and wait a full ten years before revisiting. What I am saying, however, is that if there’s something out there you want to do, why not learn as much as you can about that something first? There’s no shame in being prepared for the life you want to live. 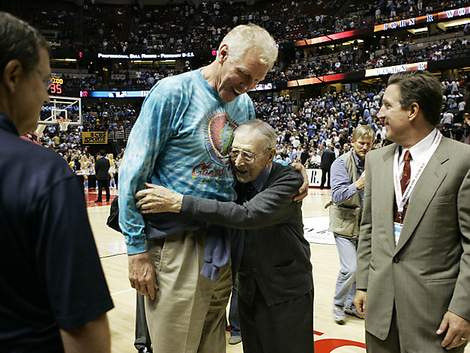 ***Yes, I know that Benjamin Franklin was the first one to use the quote, but there was zero chance that I wasn’t using that photo of Wooden gleefully hugging tie-dye cool dad Bill Walton. Zero chance.